Google on Tuesday announced two new Nexus phones, as expected -- the Nexus 5X and Nexus 6P -- that will run the new, more capable Android 6.0 operating system, also known as Marshmallow. The phones will feature better cameras, bigger batteries, an improved fingerprint sensor on the rear of the case and power-saving features provided via Marshmallow software. One other important but little-known feature of the new OS should offer greater security to business users and IT managers, analysts said. Namely, that new feature in Marshmallow puts the ability to separate work and personal apps and services right inside the OS, something that is often provided by phone makers as add-on software. That capability, called containerization, is not a new concept, but its availability is considered important to businesses to keep workers from improperly sharing sensitive corporate data via personal email or in other ways. For users, keeping personal photos and other personal data in a separate space makes it easier to organize and preserve that data, especially if a worker has to surrender the phone to the business for some reason. "Google has built the concept of containerization right into the new OS, something that Apple has not yet done," noted Gartner analyst Ken Dulaney on Tuesday. Referring to the previous Android release, called Lollipop, he added, "We have been very impressed by Lollipop and Android for Work. We think that Marshmallow only takes this further for business." By putting containerization directly inside Marshmallow, Google makes it easier to separate any app for personal use versus work uses, Dulaney said. Prior to this release, an Android app developer had to create different versions of a single app for each different mobile device management (MDM) package. "Now all apps can be containerized, and that gets Android away from the artificial strictures" of each MDM package, Dulaney said. Both new phones will be able to take advantage of Marshmallow's containerization capability, as will Nexus 5, 6, 7 and 9 phones in an over-the-air update next week, Google announced. Both new phones running Marshmallow are also available for pre-order today, unlocked, in the Google Store in four countries, including the U.S. The new Nexus 5X, built by LG, features a 5.2-in. display, and starts at $379 for the 16GB model. The Nexus 5P, built by Huawei, features a 5.7-in. display and starts at $499 for the 32GB model. Both will ship in mid-October and both include fast 64-bit processors. Google CEO Sundar Pichai opened today's event with a justification for Nexus devices, which he referred to as companions to the latest Android software. "What we do every year is push the next generation of computing forward and build hardware to work together and go along with the next generation of software," he said. "We do that with Nexus devices." All of Google's latest technology, including improved machine learning capabilities in Android 6.0, are intended to improve the user experience, he added. 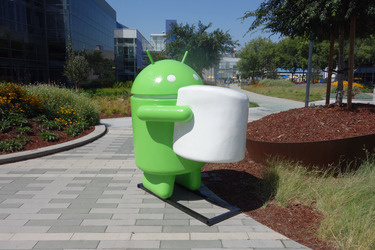 A statue for Google's Android Marshmallow operating system sits on the Google campus in Mountain View, Calif.
Android for Work, which Google announced a year ago, now is being tested, or is partially or fully deployed by 10,000 companies, Pichai added. These organizations include the World Bank, the U.S. Army and Guardian Life. Android has not been as popular as the iPhone for use in U.S. businesses, even though Android devices from multiple manufacturers far outweigh the use of iPhones globally for consumers and workers alike. In the second quarter of 2015, Gartner recently reported, Android took 83% of the global smartphone market, with iOS getting 12%. Android for Work is designed to add capabilities needed by IT shops, including centralized management of apps, devices and services. But the phones "are a way for Google to show off its software and now more than ever they seem to have to do that because successful Android developers are [changing or] layering their 'stuff' on top," said Carolina Milanesi, an analyst at Kantar WorldPanel ComTech. The latest phones from Google are more about "proving what Android 6.0 can do as well as what a pure Android experience at a competitive price point can offer," she added. Nexus sales have not made a difference to Android overall, totaling only about 1% of all Android sales, she said. "But Nexus has helped LG prove they can do good devices," she said. "Both new phones look competitive, especially if you are looking for the highest-end Android smartphones," added Patrick Moorhead, an analyst at Moor Insights & Strategy. Compared to the latest iPhones, the new Nexus phones will cost less and offer distinctive laser camera focus and higher-resolution displays, he said. "With these new phones, Google will continue to hold onto Android enthusiasts, but I haven't seen anything that would pull a lot of Apple customers over," Moorhead said. However, for businesses, Google is moving in the right direction with Nexus running Android, Gartner's Dulaney added. "Google has needed to have at least an option with Nexus like Apple does, where there are devices that receive updates directly from Google with the stock Android image," he noted. Without Nexus, the process of upgrading through various Android phone makers involves multiple steps. This has proven frustrating for business users who hope to stay abreast of Android advances and take advantage of them as soon as possible. "Nexus gives the market a direct-from-Google option, which I think only keeps the market stronger," Dulaney said. While the new Nexus cameras may not be the central incentive for business buyers, there are many business users who will take advantage of the 12.3-megapixel rear camera in the Nexus 6P and the 12-megapixel rear camera in the Nexus 5X. Both cameras also feature larger pixel sizes for better photos, larger even than the iPhone 6S Plus, Google announced. Hundreds of Marshmallow features were first announced at Google I/O in May. Google said its rear fingerprint scanner will support Android Pay authorizations and will unlock the phones in 600 milliseconds, with a very low failure rate. The fingerprint reader will also "learn" each time it is used to improve functionality. Further, Google said the new phones will reduce the amount of preloaded software, as a response to users' complaints that too many Android phones have too much bloatware. Google didn't say how much preloaded software will be provided. One feature, called Now on Tap, will combine Google search capabilities with multiple features. In a quick demonstration, Google showed how a long press on the home button from within a search for a restaurant opened up added information, such as directions to the restaurant or Yelp reviews and even the ability to quickly create a calendar event. Because of Marshmallow, the batteries in both phones will last longer on a charge, with up to 30% more life with the screen off, Google said. The Nexus 6P boasts a big 3,450-mAh battery, while the 5X has a 2,700-mAh battery. One new feature that business users might find especially valuable is Nexus Protect, which offers a two-year warranty for mechanical breakdown as well as accidental damage. Previously, Nexus had a one-year manufacturer's warranty only. Nexus Protect will cost $65 for the Nexus 5X and $89 for the Nexus 6P, and users can file a claim for a broken phone any time, then receive a replacement device the next day, Google said. Google also charges $30/month for Project Fi, now expanded to the Nexus 6P and Nexus 5X. Launched in April on the Nexus 6 smartphone, Project Fi combines cellular and Wi-Fi network services for its users, and uses the Sprint and T-Mobile cellular networks.